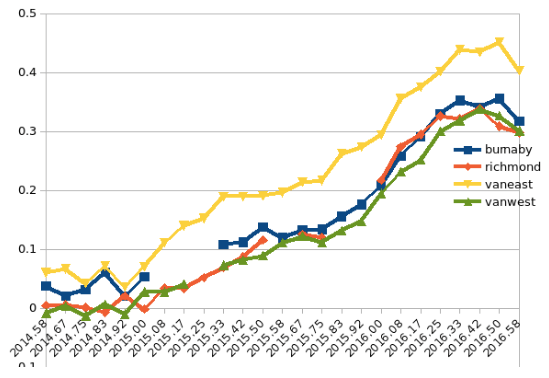 The much anticipated August 31, 5pm cutoff for market stats has come and gone. Before we dive in let me just touch on all the counter arguments quickly. Yes, one month after the tax it is still too early to tell how much of this slow down is a direct result from the tax. As i’ve mentioned in a previous post FOMO Drives Vancouver Real Estate Market, much of this slow down appears to be from a change in local buyers psychology. Also to the online troll who wants to call this post “Chicken Little” please don’t forget my job as a Realtor is to sell you a house. Therefor it’s probably in my best interest to pretend like things are all good and rosey in the market ala Cameron Muir. (Economist of the Real Estate Board). But this isn’t about me, this is about you, the public. So without further ado here are my findings for the month of August 2016. Detached houses took a hit. In fact they didn’t just take a hit, they took a Muhammed Ali straight right knock out punch. I studied arguably the 4 biggest markets, Richmond, Vancouver East, Vancouver West, and Burnaby. There were 93 price reductions this month. It appears the median sales price actually increased to $1,700,000 up from $1,590,000 last month. This is probably because of a couple high end homes which sold and skewed the data. Saretsky/Davidoff Price Index (our unique algorithm to track prices) has determined a 3% price drop since June 2016. There were 53 price reductions this month. Median sales price dropped to $1,450,000 down $100,000 compared to July. Saretsky/Davidoff index has found a 5% drop in prices since July 2016. There were 38 price reductions this month in Vancouver West. Median price was way down from 3,400,000 in July to $3,062,000. Again this steep of a price drop could be due to what kind of inventory was sold for this particular month. Saretsky/Davidoff index has found roughly a 3% drop in prices since June. There were a total of 52 price reductions this month in Burnaby. Median sales price for August was $1,520,000 vs $1,675,000 in July. Saretsky/Davidoff index has surprisingly not found any changes in the current prices. Most likely due to not enough inventory being sold. Saretsky/Davidoff Index shows prices on downward trend. The sales numbers I am using are from the Realtor MLS system which shows the sold date as per the date the contract is signed and accepted by both parties, not when it closes. I’ve talked about this in a Vancouver Sun article here. Roughly 50% of deals are not reported to the board until after one week. However even if were to assume the numbers currently only show 3 weeks worth of sales it would still add up to one painfully slow month for the detached housing market in August. The Real Estate Board monthly sales stats are based on when contracts are PROCESSED. Which in my opinion is not the most accurate way to track sales because it does not reflect current market conditions. 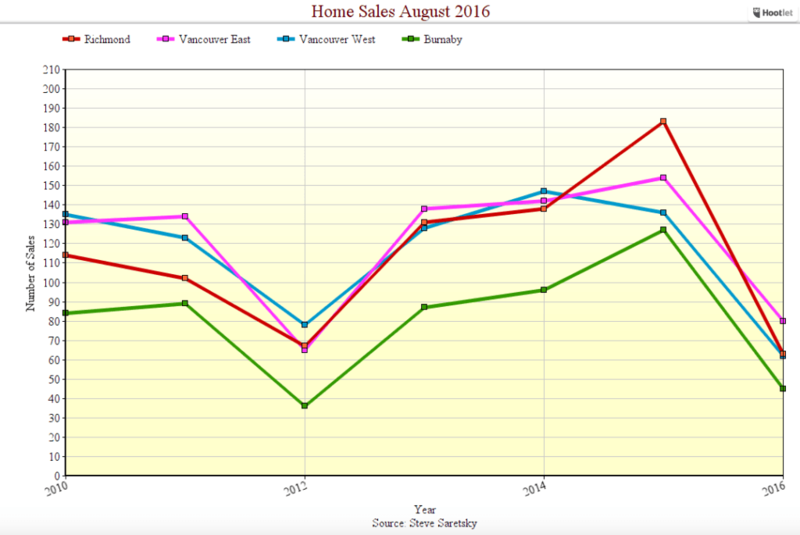 I explained it further in Demystifying the Latest Vancouver Market Stats. If you want to know real time market conditions you have to look at the date when contracts are signed as it shows current thinking and psychology between buyer and seller. So although the numbers I gave you will change over the next couple weeks as the last bit of sales trickle through, the number will not climb much. However If you INSIST on using the boards PROCESSED reporting then here are their numbers which are firm for August and will not change. Any way you want to slice and dice the numbers there has been a huge plunge. All eyes on September. Next articleIs the Condo/Townhouse Market Cooling?